I can't help but point out the fact that the entire premise of this movie is horrifying. The only way the bergens can feel happiness is by eating the trolls, so they keep the trolls in a caged tree in the center of town and make a ritual of cooking and eating one each year. That's some dystopian sh*t for a kid's movie if you really stop to think about it. Aside from that, the rest of the movie is totally adorable. 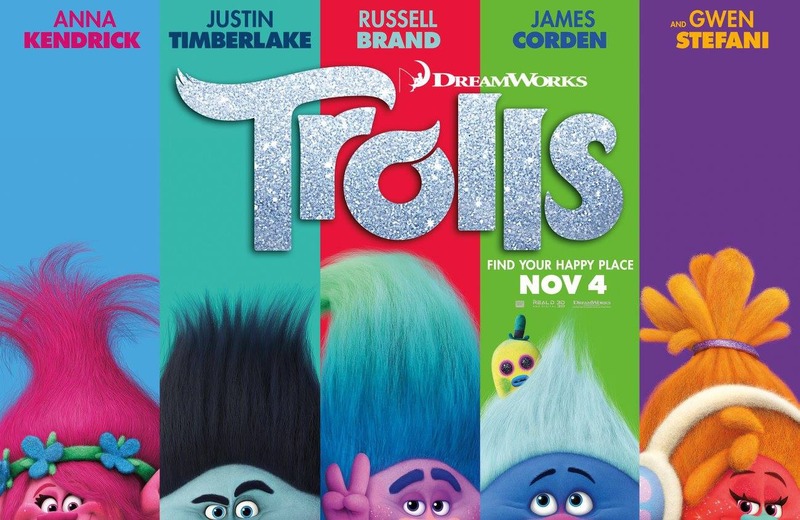 From the overly happy dance sequences to the wild parties and glitter everywhere, the movie is nonstop fun. Even during the "serious-ish" parts. The trolls and their propensity to sing and hug can't help but make you smile. The movie is clever in that it mixes both familiar popular music with a couple of original tracks, making the musical interludes easier to watch the first time. Instead of having to decide whether or not you like each song, you know already know most of them, including the best song ever, True Colors. And honestly, Anna Kendrick's singing voice does not get enough credit. It's clear and precise and it sounds young and perky enough match the cuteness of her troll character. Because it's not enough to have a good voice (I'm talking to you, Idina Menzel) - it has to make sense with the story. On that note, I'm a little disappointed at the casting of Justin Timberlake. I get the desire to have the same actor do both the talking and singing for simplicity's sake, but he's not the most pleasant person to listen to. He's not terrible or anything, I'm just perplexed at his continued presence in movies. I was hoping it was a phase. Either way, the movie is wholly enjoyable for both kids and adults. It's just clever enough to keep grown-ups laughing, while maintaining enough action and seizure-inducing color for kid's short attention spans. Final word: I challenge you to find a kid who doesn't like this movie.